Residents were out in force to say their own goodbye to a record number of care home staff that have landed places at university this autumn. 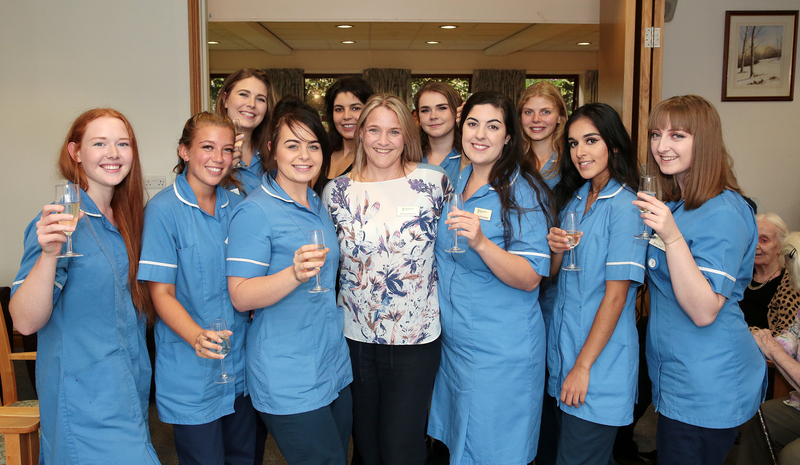 Ten employees from Sheffield’s renowned Broomgrove Care Home are going on to further education within the healthcare industry – two to medical school, seven to pursue nursing degrees and one to do a physiotherapy degree. The home enjoys a strong working relationship with the nearby King Edward VII School. Many of the ten staff started at Broomgrove immediately after leaving school or even earlier in some cases. Care home staff organised a presentation ceremony to allow residents to say a personal ‘farewell’ to the individuals. Donna Pierpoint, the manager at Broomgrove Care Home, said: “We’re always keen for members of staff to better themselves but this year has been record – even for us! Many of the students won’t be leaving altogether – some will continue to work at Broomgrove Nursing Home and do ‘bank’ shifts in between their studies. Broomgrove, which is sited just off Ecclesall Road in Sheffield, is the only home of its kind with charitable status in the city and surrounding region. Broomgrove Nursing Homes is situated at 30 Broomgrove Road, Sheffield S10 2LR. Tel: 0114 266 1311. Ten of the carers at Broomgrove are off to university to do their nursing sourses and had a leaving ceremony with residents before they left, Sheffield, United Kingdom, 16th August 2018. Photo by Glenn Ashley. Pic caption: Saying a fond farewell to Broomgrove Nursing Home (back row left to right): Imogen Andrews (going to Southampton to study medicine), Sarah Lynch (going to Derby to do nursing), Alice Jones (going to Salford to do nursing), Lizzie Nice (going to Northumbria to do nursing), (front row left to right) Sophie Barrett (going to Southampton to do medicine), Devon Seemley (going to Hallam University to do nursing), Laura Davis (going to Chesterfield to do nursing), Tegann Richardson (going to University of Sheffield to do nursing), Zyra Yaseen (going to Hallam University to do nursing) and Emily Scott (going to Huddersfield to do physiotherapy).